Vivacom: Nieuwe frequentie voor Crime & Investigation Network: 12560.00MHz, pol.V (DVB-S2 SR:30000 FEC:3/4 SID:302 PID:3202[MPEG-4]/3302 aac Bulgarian- VideoGuard). Crime & Investigation Network in DVB-S2 op 12137.00MHz, pol.V SR:30000 FEC:5/6 SID:223 PID:3301[H.265]/3302 aac English (Conax). Nieuwe frequentie voor Crime & Investigation Network: 12169.00MHz, pol.H (DVB-S2 SR:30000 FEC:3/4 SID:3033 PID:3302[MPEG-4]/3303 aac Czech,3304 aac English- Conax & Nagravision 3). Sky Digital: Nieuwe frequentie voor Crime & Investigation Network: 11836.00MHz, pol.H (DVB-S SR:27500 FEC:5/6 SID:5554 PID:518/656 English- VideoGuard). Dolce TV: Nieuwe frequentie voor Crime & Investigation Network: 12175.00MHz, pol.V (DVB-S SR:30000 FEC:7/8 SID:267 PID:467/567 English- VideoGuard). DMC: Crime & Investigation Network is nu gecodeerd in Cryptoworks & Irdeto 2 (11523.00MHz, pol.H SR:12000 FEC:3/4 SID:4811 PID:1501/1511 English,1512 Dutch,1518 Czech). DMC: Crime & Investigation Network (United Kingdom) momenteel ongecodeerd (FTA) te ontvangen (11523.00MHz, pol.H SR:12000 FEC:3/4 SID:4811 PID:1501/1511 English,1512 Dutch,1518 Czech). DMC: Crime & Investigation Network is encrypted again after being temporarily unencrypted on 11428.00MHz, pol.V SR:25720 FEC:3/4 SID:6025 PID:1501/1511 English,1512 Dutch,1518 Czech (Cryptoworks & Irdeto 2). Cosmote: Crime & Investigation Network (United Kingdom) is in DVB-S2 van start gegaan op 12168.00MHz, pol.H SR:27500 FEC:2/3 SID:1134 PID:4134[MPEG-4]/5134 English - VideoGuard. DMC: Nieuwe frequentie voor Crime & Investigation Network: 11428.00MHz, pol.V (DVB-S SR:25720 FEC:3/4 SID:6025 PID:1501/1511 English,1512 Dutch,1518 Czech- FTA). Joyne: Crime & Investigation Network (United Kingdom) is in DVB-S2 van start gegaan op 12073.00MHz, pol.V SR:30000 FEC:3/4 SID:420 PID:3001[MPEG-4]/3002 Dutch - Conax. Total TV: Crime & Investigation Network is nu gecodeerd in Conax & VideoGuard (10972.17MHz, pol.V SR:27500 FEC:3/5 SID:1367 PID:267[MPEG-4]/3671 English). Total TV: Crime & Investigation Network (United Kingdom) momenteel ongecodeerd (FTA) te ontvangen (10972.17MHz, pol.V SR:27500 FEC:3/5 SID:1367 PID:267[MPEG-4]/3671 English). Canal Digitaal & -115-SkyLink & TV Vlaanderen: Crime & Investigation Network (United Kingdom) momenteel ongecodeerd (FTA) te ontvangen (12109.50MHz, pol.H SR:27500 FEC:3/4 SID:5064 PID:3518[MPEG-4]/3458 Dutch,3538 English). Vivacom: Crime & Investigation Network in DVB-S2 op 11595.00MHz, pol.V SR:30000 FEC:3/4 SID:302 PID:3202[MPEG-4]/3302 aac Bulgarian (VideoGuard). Vivacom: Crime & Investigation Network (United Kingdom) is in DVB-S2 van start gegaan op 11550.00MHz, pol.V SR:30000 FEC:3/4 SID:302 PID:3202[MPEG-4]/3302 aac Bulgarian - VideoGuard. Total TV: Crime & Investigation Network in DVB-S2 op 10972.17MHz, pol.V SR:27500 FEC:3/5 SID:1367 PID:267[MPEG-4]/3671 English (Conax & VideoGuard). Crime & Investigation Network switched to DVB-S2 at 11231.00MHz, pol.V SR:30000 FEC:3/5 PID:209/3091 English. Crime & Investigation Network (United Kingdom) is in DVB-S2 van start gegaan op 12109.50MHz, pol.H SR:27500 FEC:3/4 SID:5064 PID:3518[MPEG-4]/3458 Dutch,3538 English - Cryptoworks & Irdeto 2. Crime & Investigation Network (United Kingdom) is in DVB-S van start gegaan op 11520.00MHz, pol.H SR:12000 FEC:3/4 SID:4811 PID:1501/1511 English,1512 Dutch,1518 Czech - Cryptoworks & Irdeto 2. DMC: Crime & Investigation Network is nu gecodeerd in Cryptoworks & Irdeto 2 (11150.00MHz, pol.V SR:19275 FEC:3/4 SID:1005 PID:2301/2311 English,2312 Dutch,2318 Czech). DMC: Crime & Investigation Network (United Kingdom) momenteel ongecodeerd (FTA) te ontvangen (11150.00MHz, pol.V SR:19275 FEC:3/4 SID:1005 PID:2301/2311 English,2312 Dutch,2318 Czech). Orange Romania: Crime & Investigation Network (United Kingdom) is in DVB-S2 van start gegaan op 12012.00MHz, pol.V SR:30000 FEC:3/4 SID:8116 PID:1161[MPEG-4]/1162 English - Viaccess 5.0. Multichoice Africa: PID zijn veranderd voor Crime & Investigation Network op 12054.00MHz, pol.H: PID:251/252 English SID:215 ( SR:27500 FEC:3/4 - Irdeto 2). Sky Digital: Nieuwe FEC voor Crime & Investigation Network op 12188.00MHz, pol.H: FEC:5/6 ( SR:27500 SID:4802 PID:514/642 English - VideoGuard). Orbit Showtime Network: Nieuwe frequentie voor Crime & Investigation Network: 11372.69MHz, pol.H (DVB-S2 SR:27500 FEC:2/3 SID:427 PID:3062[MPEG-4]/3063 English- BetaCrypt & Irdeto 2). Nieuwe frequentie voor Crime & Investigation Network: 11076.00MHz, pol.H (DVB-S2 SR:45000 FEC:3/4 SID:1005 PID:2301/2311 English,2312 Dutch,2318 Czech- Cryptoworks & Irdeto 2). Crime & Investigation Network switched to Nilesat 201 satellite at 12073.00MHz, pol.H (DVB-S2 , 12073.00MHz, pol.H SR:27500 FEC:2/3 PID:3062[MPEG-4]/3063 English). Nieuwe frequentie voor Crime & Investigation Network: 12607.00MHz, pol.V (DVB-S2 SR:26660 FEC:2/3 SID:3033 PID:3302[MPEG-4]/3303 aac Czech- Conax & Nagravision 3). Crime & Investigation Network (United Kingdom) is in DVB-S2 van start gegaan op 12054.00MHz, pol.H SR:30000 FEC:3/4 SID:1036 PID:3602[MPEG-4]/3603 aac Slovakian - Nagravision 3. Dolce TV: Crime & Investigation Network (United Kingdom) is in DVB-S van start gegaan op 12607.00MHz, pol.V SR:30000 FEC:7/8 SID:267 PID:467/567 English - VideoGuard. Canal Digitaal & TV Vlaanderen: Nieuwe frequentie voor Crime & Investigation Network: 11856.00MHz, pol.V (DVB-S2 SR:27500 FEC:2/3 SID:7052 PID:552[MPEG-4]/102 Dutch,103 Czech- Mediaguard 3 & Nagravision 3 & Viaccess 5.0). Canal Digitaal & SkyLink & TV Vlaanderen: Nieuwe FEC voor Crime & Investigation Network op 11914.50MHz, pol.H: FEC:5/6 ( SR:27500 SID:20827 PID:527/107 Dutch,108 Czech - Mediaguard 3 & Nagravision 3 & Viaccess 5.0). Sky Digital: Nieuwe frequentie voor Crime & Investigation Network: 12188.00MHz, pol.H (DVB-S SR:27500 FEC:2/3 SID:4802 PID:514/642 English- VideoGuard). Canal Digitaal & SkyLink & TV Vlaanderen: Crime & Investigation Network (United Kingdom) is in DVB-S van start gegaan op 11914.50MHz, pol.H SR:27500 FEC:3/4 SID:20827 PID:527/107 Dutch,108 Czech - Cryptoworks & Mediaguard 3 & Nagravision 3. Total TV: Crime & Investigation Network is nu gecodeerd in VideoGuard (11231.00MHz, pol.V SR:30000 FEC:3/4 SID:709 PID:209/3091 English). Total TV: Crime & Investigation Network (United Kingdom) momenteel ongecodeerd (FTA) te ontvangen (11231.00MHz, pol.V SR:30000 FEC:3/4 SID:709 PID:209/3091 English). DMC: Crime & Investigation Network is nu gecodeerd in Cryptoworks & Irdeto 2 (11150.00MHz, pol.V SR:19275 FEC:3/4 SID:1005 PID:2301/2311 English,2312 Dutch). DMC: Crime & Investigation Network (United Kingdom) momenteel ongecodeerd (FTA) te ontvangen (11150.00MHz, pol.V SR:19275 FEC:3/4 SID:1005 PID:2301/2311 English,2312 Dutch). Vivacom: Crime & Investigation Network (United Kingdom) is in DVB-S2 van start gegaan op 11673.00MHz, pol.V SR:30000 FEC:2/3 SID:302 PID:3202[MPEG-4]/3302 English - VideoGuard. Sky Digital: Nieuwe frequentie voor Crime & Investigation Network: 11603.85MHz, pol.V (DVB-S SR:27500 FEC:2/3 SID:4802 PID:514/642 English- VideoGuard). Max TV: Nieuwe FEC voor Crime & Investigation Network op 11678.25MHz, pol.H: FEC:5/6 ( SR:30000 SID:34 PID:2819[MPEG-4]/2563 English - Nagravision 3). Crime & Investigation Network switched to Eutelsat 16A satellite at 11676.00MHz, pol.V (DVB-S2 , 11676.00MHz, pol.V SR:30000 FEC:2/3 PID:2819[MPEG-4]/2563 English). 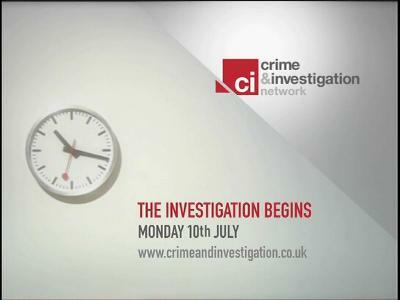 Crime & Investigation Network switched to DVB-S2 at 12073.00MHz, pol.H SR:27500 FEC:2/3 PID:3062[MPEG-4]/3063 English. Orbit Showtime Network: Crime & Investigation Network in DVB-S op 12073.00MHz, pol.H SR:27500 FEC:3/4 SID:427 PID:3062/3063 English (BetaCrypt & Irdeto 2). Sky Digital: PID zijn veranderd voor Crime & Investigation Network op 12304.00MHz, pol.H: PID:516/644 English SID:9348 ( SR:27500 FEC:2/3 - VideoGuard). Max TV: Crime & Investigation Network is back on 11676.00MHz, pol.V SR:30000 FEC:2/3 SID:34 after a break ( PID:2819[MPEG-4]/2563 English - Nagravision 3). Max TV: Crime & Investigation Network (United Kingdom) is in DVB-S2 van start gegaan op 11676.00MHz, pol.V SR:30000 FEC:2/3 SID:34 PID:2819[MPEG-4]/2563 English - Nagravision 3. Digitürk: Crime & Investigation Network is nu gecodeerd in Cryptoworks & Irdeto 2 (11513.00MHz, pol.H SR:27500 FEC:3/4 SID:5315 PID:2115/2216 Turkish,2217). Digitürk: Crime & Investigation Network (United Kingdom) momenteel ongecodeerd (FTA) te ontvangen (11513.00MHz, pol.H SR:27500 FEC:3/4 SID:5315 PID:2115/2216 Turkish,2217). Multichoice Africa: Crime & Investigation Network is nu gecodeerd in Irdeto 2 (12054.00MHz, pol.H SR:27500 FEC:3/4 SID:215 PID:1066/1067 English). Multichoice Africa: Crime & Investigation Network (United Kingdom) momenteel ongecodeerd (FTA) te ontvangen (12054.00MHz, pol.H SR:27500 FEC:3/4 SID:215 PID:1066/1067 English). Cyfra +: Crime & Investigation Network (United Kingdom) is in DVB-S van start gegaan op 11137.00MHz, pol.H SR:27500 FEC:3/4 SID:7324 PID:3524/3644 English - Mediaguard 3. DMC: Crime & Investigation Network (United Kingdom) is in DVB-S van start gegaan op 11150.00MHz, pol.V SR:19275 FEC:3/4 SID:1005 PID:2301/2311 English,2319 Polish - Cryptoworks. Sky Digital: PID zijn veranderd voor Crime & Investigation Network op 12304.00MHz, pol.H: PID:515/643 English SID:9348 ( SR:27500 FEC:2/3 - VideoGuard). Digitürk: Crime & Investigation Network is nu gecodeerd in Cryptoworks (11513.00MHz, pol.H SR:27500 FEC:3/4 SID:5315 PID:2115/2216 Turkish,2217). Digitürk: Crime & Investigation Network (United Kingdom) is in DVB-S van start gegaan op 11513.00MHz, pol.H SR:27500 FEC:3/4 SID:5315 PID:2115/2216 Turkish,2217 - Cryptoworks. Sky Digital: Crime & Investigation Network (United Kingdom) is in DVB-S van start gegaan op 12304.00MHz, pol.H SR:27500 FEC:2/3 SID:9348 PID:515/663 English - VideoGuard. Digitürk: Crime & Investigation Network is testing in DVB-S Cryptoworks on 11513.00MHz, pol.H SR:27500 FEC:3/4 SID:5315 PID:2115/2216 Turkish,2217. Sky Digital: A testcard identified Crime & Investigation Network has started in VideoGuard on 12304.00MHz, pol.H SR:27500 FEC:2/3 SID:9348 PID:515/663 English.